The Ink Trap: New Girlfriends Blog Hop!!! Hey all! Welcome back! 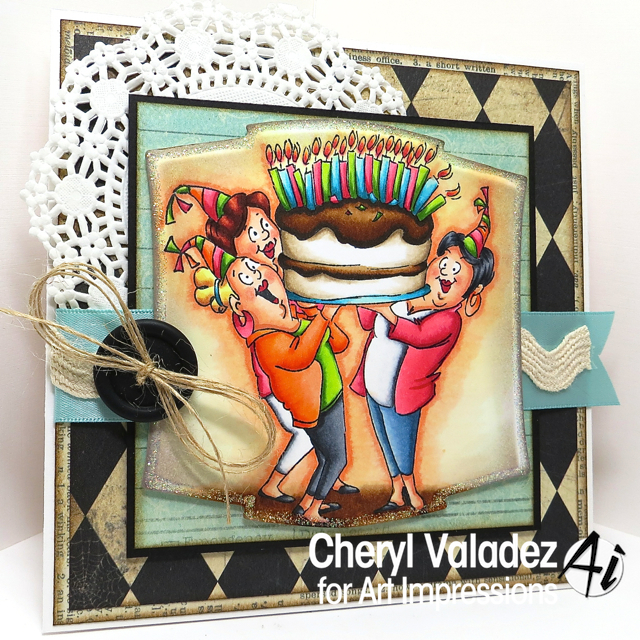 At Art Impressions, we are hopping to celebrate the release of some brand new Girlfriend images...WOO HOO! You know 'em, you love 'em, you can't live without 'em! We all need our girlfriends. We laugh together, cry together, rejoice together. They are our rocks and they lift us up! Sometimes they also need to help us lift our birthday cakes up...LOL! I just turned 47 and let me tell you, I'm certainly glad I didn't opt for candles ;) No need to start the fire detectors chirping! This image is aptly called Giant Cake and now I'm craving something sweet. Cake, anyone? Pick up all of the new Girlfriend images in the Ai Shop. You should have arrived from Karen Day's fabulous blog. Next you'll head to Kerry Kung's blog where you'll no doubt find something wonderful. If you get lost along the way, head to the Art Impressions Blog and you'll have access to the entire Hop List to get you back on track. Oh yeah, and don't forget our awesome Girlfriend Giveaway below! Your coloring of this image is just amazing! I love how the colors just POP! your chocolate cake looks good enough to eat! A perfect girlfriend birthday card, Cheryl! They look ready to jump right off the page - great colours! This is fabulous! 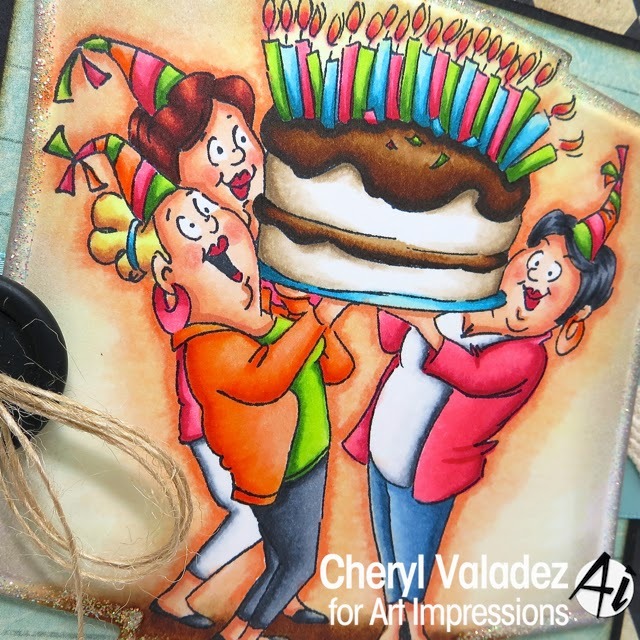 I just love all those vivid colors paired with the distressed dp, and the glitterfied edge on the image die cut is gorgeous! Signing off from Georgia! I think the birthday cake is my favorite. Signing off from Ohio! DIBBS!!!! DIBBS!!! DIBBS!!!!! :) Damn girl, you are GOOD!!!! You continously amaze me! You make me want to go home and play with my images and markers! Fabulous coloring--signing off from Ohio. Your coloring is beautiful. I love the Giant Cake. This is amazing, Cheryl! Love the vibrant colors.... you really make the image come to life. Love the card - the coloring is amazing! Such an awesome card!!!! 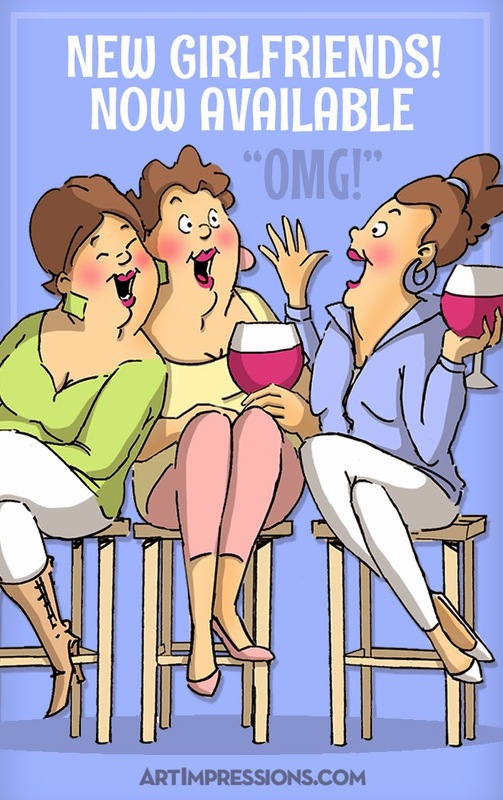 Your coloring brings these lovely ladies to life!!! What a beautiful celebration!!! Thanks for all the amazing inspiration Cheryl!!! You rock! I love the bold coloring on this card. It really pops against your background choices. Fabulous! Your colouring is absolutely amazing, just like those new Girlfriend stamps ! Signing off from Venlo in the Netherlands ! I absolutely love the girlfriends sets! I can't wait to get these new ones! Signing off from Charlotte NC. Fabulous card...beautiful coloring! But I have you beat..I will be 58 this year!!! I don't even bother with candles anymore!! Signing off from Ft. Wright, Kentucky! Awesome card. I love your gorgeous bright and beautiful colouring on the muted, distressed background. Signing off from Brisbane, Australia. Cheryl I adore your coloring! You have come a long way baby! We took the Copic class together several years ago and I have been following your blog ever since. I love your backgrounds! I would love it if you would do a tutorial and teach me how you do it! I absolutely adore this line of girlfriends and you really make them pop! I have been wanting these darlings since you debuted the first one! Outstanding Girlfriend! Such rich coloring, LOVE IT!! !